The liquid argon facilities include both small and large scale test stands. The facility manager for these test stands is Alan Hahn. Alan is the contact for general questions about using the facility, including help navigating the TSW process. The links below will take you to descriptions of each of the test stands. Materials Test Stand: used for vetting the electronegative contamination risk of materials. TallBo: used for developing scintillation light collection technologies. Blanche: used for studying high voltage breakdown in nobel liquids. LAPD: large scale cryostat for long term studies requiring a large volume of argon. Requests for time on any of these test stands may be made following these instructions. The Proton Assembly Building, or PAB, is the home of the Materials Test Stand, TallBo and Blanche. Please familiarize yourself with the general orientation to the PAB before coming to use of those systems. All systems hosted at PAB have access to a suite of gas analyzers which can detect oxygen concentrations at the parts-per-billion (ppb) level, water concentrations at the ppb level and nitrogen concentrations at the parts-per-million level. The liquid argon delivery system at PAB includes filters to remove oxgen and water contamination from the argon before it enters the different test stands. The liquid argon delivered to the different cryostats is considered ultra-pure. The Materials Test Stand (MTS) is used for vetting materials that could potentially go into a liquid argon TPC experiment. 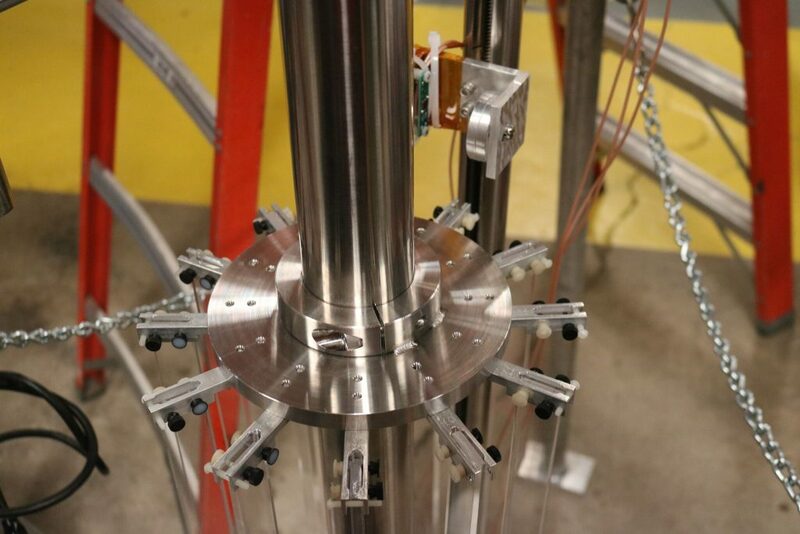 The test stand has an argon lock through which one may access a sample cage. The argon delivered into the cryostat has been filtered for oxygen and water contamination and is ultra pure. The MTS has its own filter for removing any oxygen or water introduced with a sample. It also has a nitrogen cooled condensor to allow closed operation without boiling off the argon. There is a purity monitor inside the cryostat for monitoring the effect of any material on the electron lifetime of the liquid argon. The sample will be cleaned based on the user’s preferences. The cleaning methods can include any combination of no cleaning; wiping the sample with alcohol; ultrasonic cleaning with alcohol; baking the sample in air; evacuating the sample at room temperature; evacuating the sample at an elevated temperature. The airlock is evacuated before any samples are inserted into the basket. Once the sample is inserted, it can be purged with argon gas or evacuated based on the user preference. Three tests are possible with this system. The first is a room temperature test where the sample stays in the airlock and the valve to the cryostat is opened. During this test the internal liquid argon filter is turned off. This test can last from one to several days based on user preference. After a room temperature test the valve to the cryostat is closed and the internal filter is activated to clean up the liquid argon. The second test is a liquid test where the sample is lowered into the liquid and the internal filter is turned off. This test can last one to several days based on the user preference. The final test is the vapor test where the sample is placed in the vapor space at a temperature between 120-220K. Again, this test can last one to several days based on the user preference. For all the tests the electron drift lifetime is measured and the water level is monitored in the vapor. The results of the tests and pictures of the sample will be stored in the sample database on DocDB. If you wish to test materials in the MTS please send an email specifying the material to be tested and which experiment or project the test supports. Please also specify how the material is to be prepared and the tests to be performed. Please do not send materials without first contacting the facility using the email address linked above. TallBo is a cylindrical cryostat primarily used for developing scintillation light collection technologies for LArTPC detectors. It has a 56 cm inner diameter and up to a 183 cm liquid depth for a total volume of liquid argon of 451 liters. 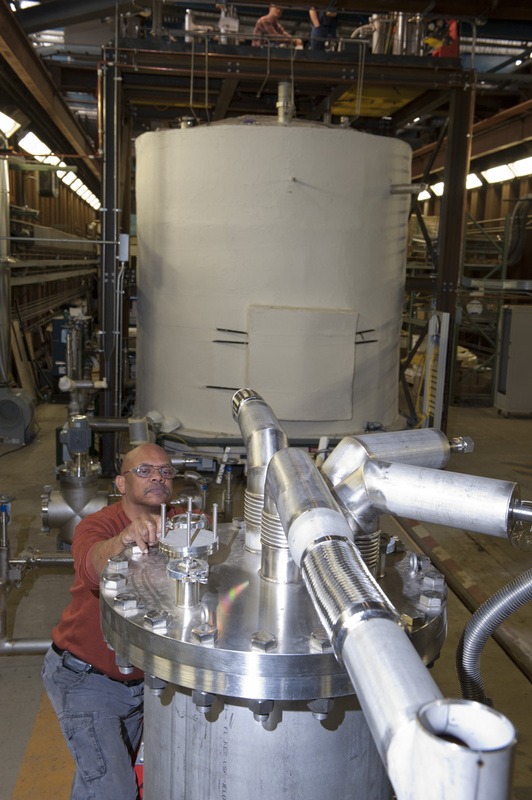 The cryostat is vacuum-jacketed for insulating the liquid argon. The drawings for TallBo are available on the LArTPC Doc-DB. The argon used to fill TallBo is filtered to remove oxygen and water contamination. TallBo has a nitrogen cooled condensor in order to provide a closed system without boil-off of the liquid argon. A vertical mover is available for use in TallBo. It is 6 feet in length and consists of a slotted channel and screw capable of moving an object mounted on the screw up and down. Outside of TallBo the mover is controlled by a rotating wheel. A counter is attached to the wheel to keep track of the position. A “Lazy Susan” device is available for installation in TallBo as well. The device is attached to a rotating 6 foot long tube and has two 3.5 inch disks that can be spaced up to 54 inches apart. These disks have the capability to mount up to 12 devices on them. The disks can be easily detached to be replaced with custom mounts. 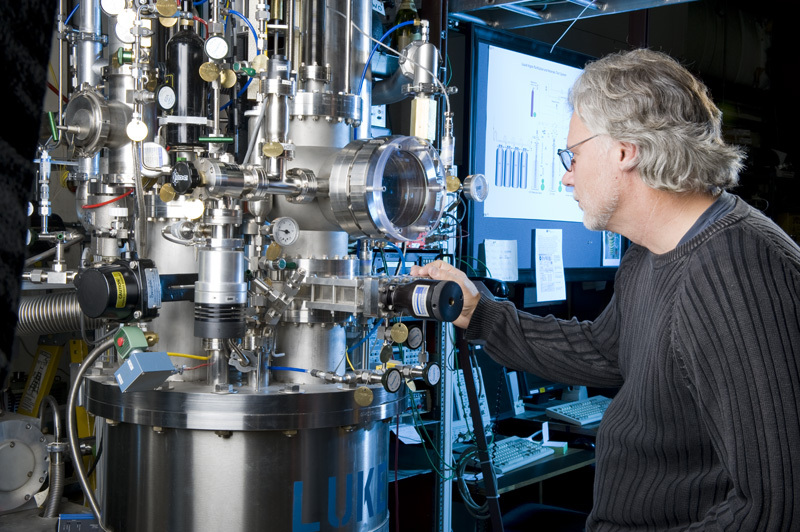 The device is controlled with a rotating wheel outside the cryostat. Although TallBo has primarily served as a light collection test facility, one could also test other kinds of systems in TallBo such as electronics and small TPCs. Blanche is a cylindrical cryostat primarily used for understanding issues related to high voltage breakdown in liquid argon. It is 152 cm tall with a 76 cm inner diameter; in practice, it is only filled to a depth of 122 cm for a total volume of liquid argon of 556 liters. 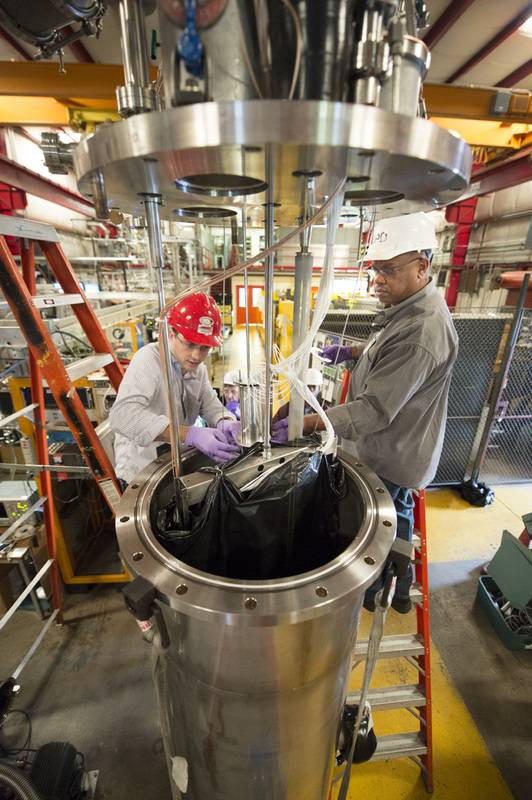 The cryostat is vacuum-jacketed for insulating the liquid argon. The drawings for Blanche are available on the LArTPC Doc-DB. The argon used to fill Blanche is filtered to remove oxygen and water contamination. Blanche has a nitrogen cooled condensor in order to provide a closed system without boil-off of the liquid argon. Although Blanche has primarily served as a high voltage test facility, one could also test other kinds of systems in Blanche such as electronics and small TPCs. The Liquid Argon Purity Demonstrator (LAPD) is a cylindrical cryostat capable of containing up to 30 tons of liquid argon. It was initially used to show that one need not evacuate a cryostat before filling with liquid argon to achieve electron drift lifetimes of more than several milliseconds. LAPD is located in the PC4 enclosure and has a full liquid argon filtering and circulation system attached to it. It also has several gas analyzers used to measure oxygen, water and nitrogen contamination in the argon over a broad range of values from a few parts-per-million to less than a part-per-billion, depending on the analyzer. LAPD is most useful for large-scale, long duration tests. While it is not exposed to a charged particle beam from the accelerator complex, it is exposed to a multitude of cosmic rays.